4003 - Jetglo, 4-string bass guitar from Rickenbacker belonging to the 4003 model. 6 months rent free usage of a Rickenbacker 4003 bass? Who would say no! The classic Rick-o-sound, flatwound strings, I instantly has 'The Paul McCartney tone' at my finger tips. Well I explained most of this information above because it made a better intro! 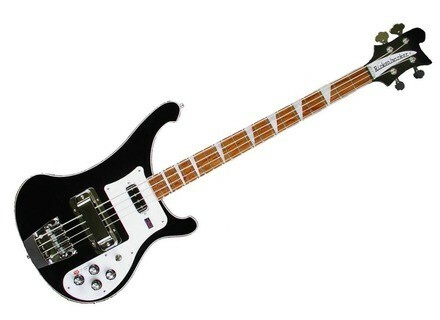 To get a new Rickenbacker 4003 you need to find one first of all. Rickenbacker only makes a limited number of instruments a year, so you are lucky if you can find one let alone a model or finish of your choice. The price is just around $2,000. This bass really had personality. The maple body and neck really make this thing snap! There is something special about a good Rickenbacker and well any good instrument for that matter. An instrument that you can feel change with your climate. You can really feed off of your emotions and become one with the instrument. Alright, enough Star Wars talk! 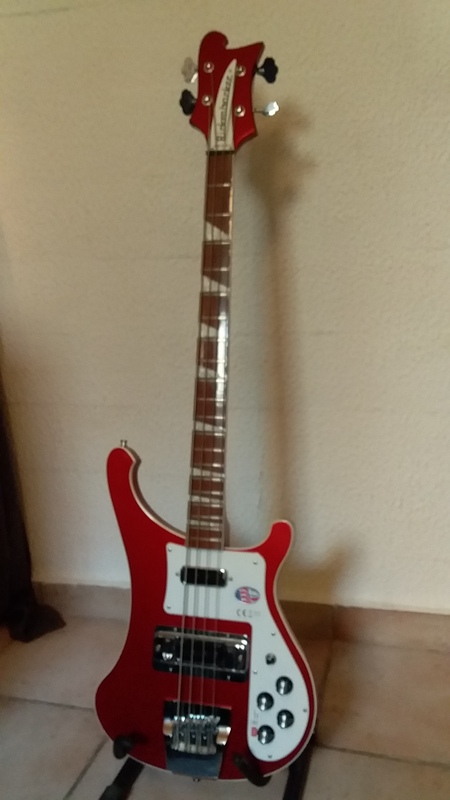 It is really hard to find other Rickenbackers and since they are mostly handmade they all sound a little different. It is worth the quest though if you can find a good one! Maple body and Maple neck. Rosewood fretboard with the hip triangular pearloid inlays. 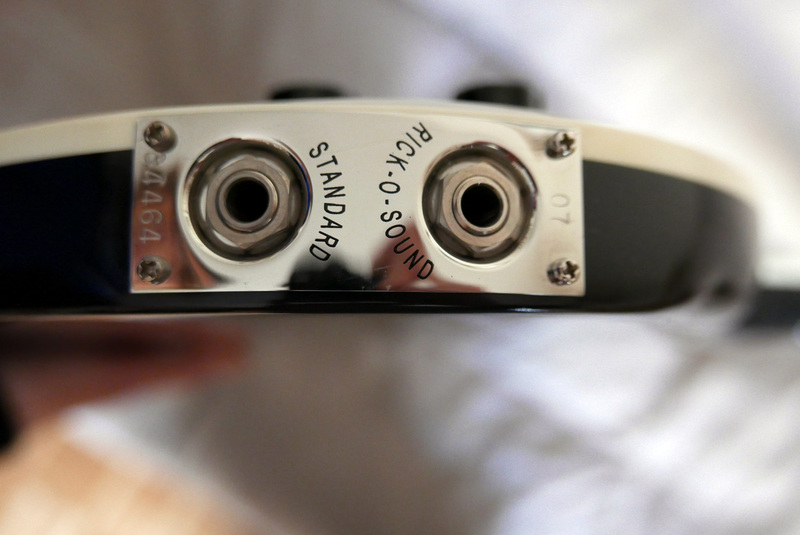 The Rick O Sound offers you a stereo or mono send. My favorite setup was send one side to a dirty guitar amp and the other to a clean loud bass rig. Everyone should own a Rick! If we all owned Ricks, world peace would happen! Well OK, maybe not. If you're a bass player you need to experience a 4003. I am mostly a studio musician who records a lot in his home studio, I occasionally play in bands too, but not very frequently. I own a great number of basses and guitars (I also play the guitar). The styles I play are funk with a jazzy undertone, alternative, pop, and rock. I have played the bass for 11 years now. I bought the instrument in a guitar shop in Utrecht in the Netherlands, I paid 1500 Euros for it (=$1800). The instrument turns out rare here, so I was quite lucky that I just stumbled on one accidentally, while inquiring about a different bass. I decided to buy it right away, because I didn't think I would get the chance again very quickly. I haven't regretted it. I like the deep grumbling sound of it. It punches through everything, even if you play it at a very low volume. I have read many times that it doesn't slap very well, but I have no problem slapping it. I think the problem is just that the attack is not as steep as many other basses, which require you to adapt your technique a little bit - slap it somewhat further on the neck, away from the pick-ups. It gives a wonderful metallic sound when you do this. I absolutely love it. I think the neck is a little too wide. I very much like the width (and sound) of my Fender Jazz bass, and I always have to acclimatise when I put the one away to play the other. The seller told me that everybody who buys a Rick bass always screws off the pick-up hood. I did so too, I think it is tremendously in the way. Unfortunately, it leaves an ugly hole when you do this. I also think the scaling screws are placed in quite an inconvenient position. You have to unscrew the entire bridge to adjust them. I have never understood how people can think it is a beautiful instrument. I think it is absolutely hideous. It reminds me too much of a cadillac. It's built like a tank, plays like a tank, and weighs like a tank, but I don't mind so much. I mostly see this bass as a valuable addition to my other basses, which have a completely different feel and personality to them. So, if you are looking for a powerful, grumbly, dominant sound, and if you don't mind the weight, I think it could be a wonderful instrument. 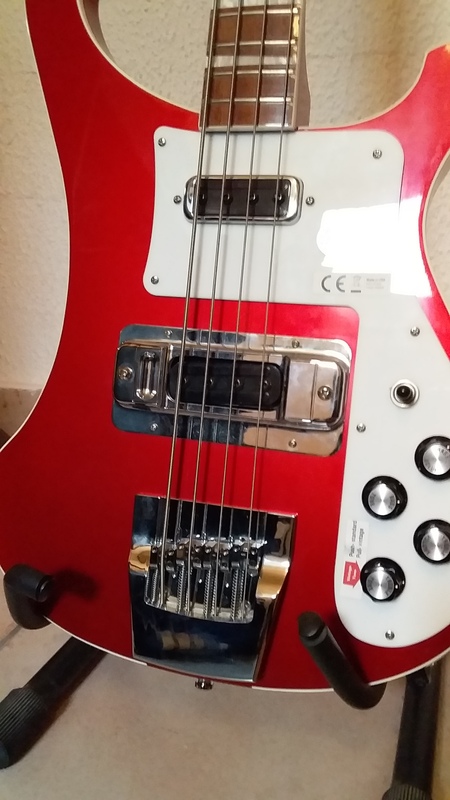 MGR/St Elmo\'s Fire's review"Rickenbacker 4003"
I've been playing bass guitar for years now, some odd number that I can't exactly remember, although it's somewhere over five. I've played in a couple bands, and still actively perform. My interests range from shoegaze and electro-pop to alt-country and folk, and a lot of places inbetween. I came upon this guitar from my father, and I've more or less adopted it off of him. I couldn't tell you how much he paid, as I don't know, but I more or less got it as a gift. The Rickenbacker's an absolutely gorgeous guitar, completely unique but not in the hideous manner of a lot of the basses that try to come off as unique. Rather, it is unique in the amount of class it exudes, and it is remarkably comfortable. The action is very nice, as is the neck-length. 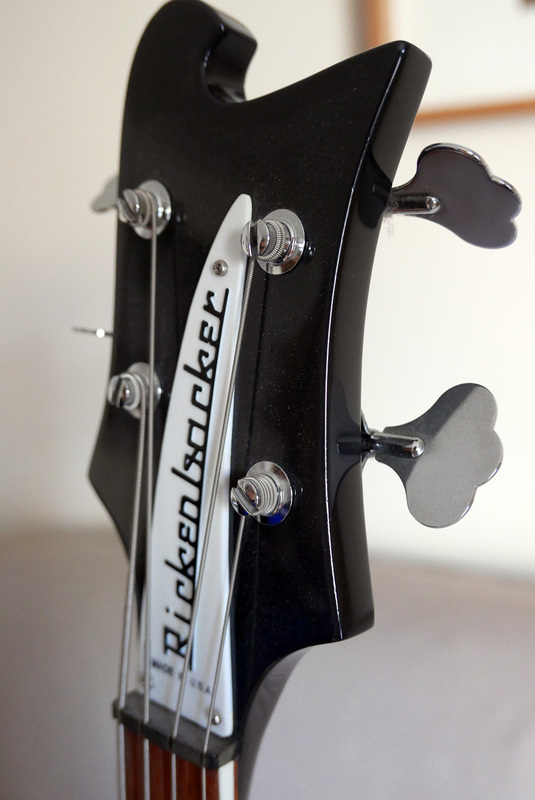 The tone is to-die-for, rich, deep, and punchy, and that trait of the Rickenbacker has kept me more than happy. It is in fact a crucial element of the band I play in, and switching to my backup bass really doesn't match up. The only real lack of the Rickenbacker is that it doesn't slap well. Conveniently enough, I rather dislike slapping, and don't use that technique. It can slap, but if you're wanting a bass just for slapping, pick something else, but not many people want a bass just for slapping. The construction and quality is beyond impeccable. Every detail is perfectly done, and despite its age, the entire thing feels as good as new. My personal favorite trait though is how well it holds tune, in that I can go without tuning for weeks at a time only to check it and see that it is still perfectly in tune. If you're looking for a classy bass with a deep, rich bass, and a punchy upper-end, here's your best bet on that matter. I've played nice Fender's and nice Ibanez's, and I've yet to find a bass that's impressed me as much as the Rickenbacker that I have. Purchased from "The Rockinn", Perth, Western Australia. early 2004 for $2200Aud (equiv to $1600 US) included the standard (ABS?) hard case. Everything... OK seriously - I've wanted one from the age of about 9 - it's the funkiest looking bass in town and does it without looking pretentious like many of the new "retro style" basses do. great neck - NO - truly great neck- though the action needed tinkering with, and what's with the weight issue everyone goes on about? I certainly found it to be well balanced and a reasonable mass for it's size. Sound wise it is far more versatile than I expected with great tonality and briliant sustain - my poor Yamaha BB is now gathering dust. On the bridge pickup it is bright and sharp and on the neck it is thumping without being too dark. Controls are just right for rolling back a bit of treble from the bridge or a bit of volume from the neck pickups to get any tone in between. it come off a poor second to my Washburn Status bass for pure instant deep punch and for slap/pop playing - which is not surprising given the Washburn's longer scale graphite neck, double ball end strings and active electronics - it's not so much an issue of being in a different league it's that they are playing a different game. This doesn't phase me as it does every thing else brilliantly. It is quite sensitive to interference due to single coil(non humbucking) pickups. I have to turn off fluro lights and CRT monitors when I DI it in to record - But with jamming and live work it's fine. It's not every day that dream and reality actually meet in the same room - but this bass meet then exceeded my expectations. What little it gives up in playing style versatility (re: slap) it gains tree fold in growling attitude stand apart appearence and first class quility of construction.